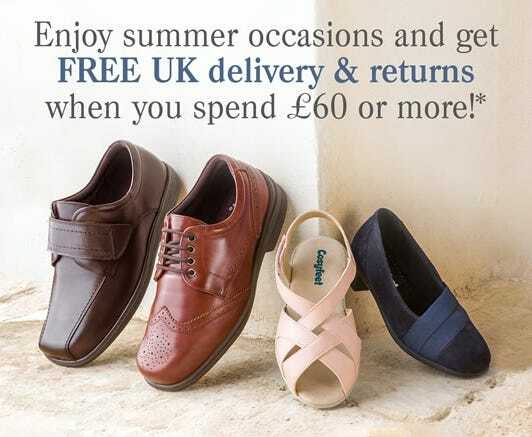 Free UK delivery on orders over £60! For a limited time only, get free UK delivery and returns with orders worth £60 or more (terms apply*). Brighten up your summer with our fabulous footwear collection. There's something for everyone in our wide range of extra roomy footwear for men and women. To redeem our free delivery offer (UK standard) on all orders of £60 or more, simply add any item/s worth £60 or more to your basket and enter the code CFBNKFP when prompted. Free delivery (UK standard) will be applied to the order. This offer expires at 11.59pm on Monday 28th May 2018. Cannot be used in conjunction with any other offer. Offer available on in-stock items only and/or if all items are in stock. We reserve the right to withdraw this offer at any time. I have just spent £120, the free delivery was never mentioned when I paid. Thank you for your comment - we regret that this offer has now expired. Thank you for your comment - unfortunately, this offer expired on the 28th May which was before you placed your order. Therefore we would not have been able to offer free delivery.